The Arabsat-5C satellite has been handed over to ARABSAT by Astrium as part of the in-orbit delivery contract. In less than a week, Arabsat-5C is the third satellite based on the highly reliable Astrium’s Eurostar E3000 platform to enter commercial service. After the successful completion of in-orbit testing to ensure that all spacecraft functions were performing as expected, the Arabsat-5C satellite, launched by Ariane 5 on September 21, 2011, was officially transferred to ARABSAT on October 26th. at the designated orbital location. The Launch and Early Orbit Phases (LEOP) were conducted from the Astrium spacecraft control centre in Toulouse, and the In-Orbit Testing from the ARABSAT main control centre in Riyadh supported by the ARABSAT control centre in Tunis. Astrium and Thales Alenia Space (TAS) were co-prime contractors for the satellite’s construction and delivery in orbit. Astrium, the team leader, supplied the Eurostar E3000 platform and assembled and tested the spacecraft. TAS supplied the communications payload. This in-orbit delivery follows Arabsat-5A and 5B satellites, successfully delivered in orbit in 2010, and completes ARABSAT’s fleet of 5th generation satellites, all now in commercial operation. 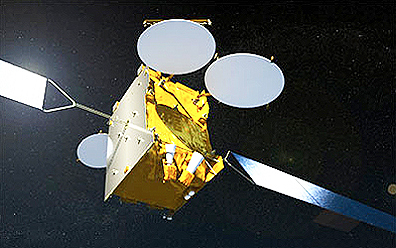 Arabsat-5C is the 6th Eurostar satellite delivered to ARABSAT. Arabsat-5C is a multi-mission satellite which provides satellite capacity in both C- and Ka-band frequencies at the ARABSAT position 20 degrees East, for a wide range of satellite communications services over a coverage area including the whole of Africa and the Middle-East. The Arabsat-5C satellite is based on Astrium’s highly reliable Eurostar E3000 product line, with a launch mass of 4770 kg and a spacecraft power of 10 kW at the end of its 15 year design lifetime.